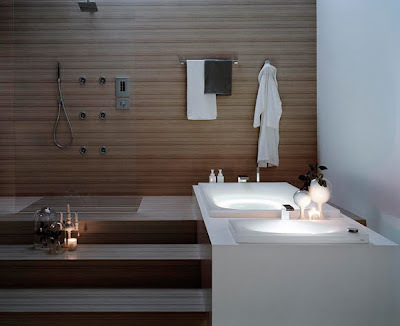 Another bath trend is to bring the look of furniture into the bath for a clean, uncluttered atmosphere. 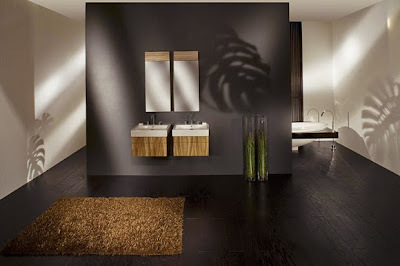 Lacava’s Aquaplane vanities exemplify the trend with a two-drawer cabinet with a Wenge finish beneath a broad basin. Cost: Cabinet $990 to $1,190; basin $490; medicine cabinet $835 to $980. Some people retreat to their home spas to shut out the world. Others want to bring it in. Make the bath your operations center with the visiPad media station, which gives you access to e-mail, SMS, Internet, telephone, radio, CDs and DVDs. Control the unit with a remote or use the splash-protected touch-screen. Made by Visiomatic, the German maker of integrated electronic home control and entertainment systems, the visiPad is offered in a range of screen sizes, from 10 inches to 46 inches across. In the quest to make the bath into a cozy haven, homeowners are installing small, direct-vent natural gas or propane fireplaces. 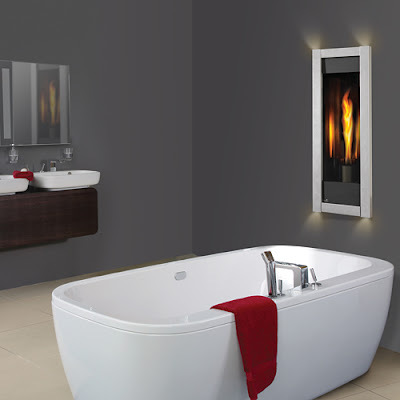 For example, Canadian manufacturer Napoleon reports that any of its direct-vent gas fireplaces can be used in a bathroom. This model, the Torch, measures just 12 inches across and has a shallow firebox that fits nicely between 2-by-6-inch wall studs. It puts out about 6,000 BTUs. Diamond Spas' Bennett reports a trend toward individual expression in bathrooms. “The shift I see is in aquatic personalization. People are looking for something unique, handcrafted quality and beauty, a bath made by artisans rather than mass-produced, a bath that was made exclusively for them.” City apartment and loft dwellers often choose small, deep Japanese soaking baths that provide a space-saving vertical soak rather than horizontal, she says. This circular, one-person tub, 42 inches around by 35 inches deep, has a bench seat. 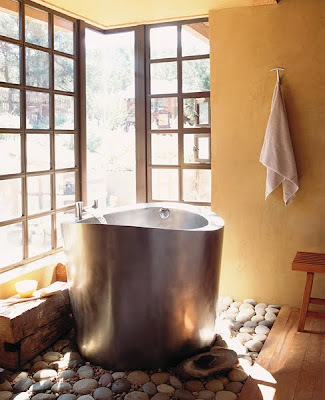 “Soaking tub” is a term used a lot for luxury tubs. “Designs vary from a smaller bath with a deeper depth, such as a Japanese soaker, to a large rectangular bath with a body forming contoured bottom,” says Stephanie Bennett of Diamond Spas, a Colorado company that crafts custom stainless steel and copper tubs to buyers’ specifications. The tub pictured here is a contemporary, oval, full-skirted soaking bath designed for two: 42 inches wide by 72 inches long by 24 inches deep. It has a midcontoured bottom with a sloping reclined area at each end for relaxing face-to-face conversation. Translucent scratch- and heat-resistant epoxy resin is used in a new line of Toto Luminist sinks and tubs that can be lit from beneath to give bathrooms an otherworldy glow. Water temperature is digitally controlled by a knob on the surface of the sink or tub. A light indicator panel uses color to read water temperature: blue is cold; light purple indicates 93.2 degrees F; dark purple is 100.4 degrees and red is very hot — 107.6 degrees. Cost: Neorest II Luminist lavatory with integrated sensor faucet $6,200; Neorest II Luminist soaking tub with integrated sensor bath faucet, $17,500. Toto was emphasizing water and energy conservation in its plumbing products long before “green” was cool. 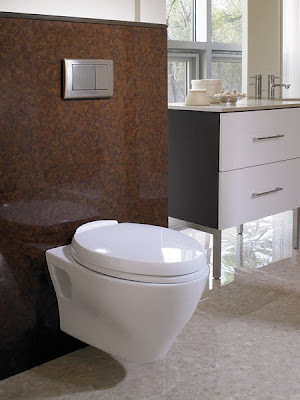 The newly released Aquia high-efficiency toilet has its tank hidden in the wall for a sleek, minimalist look that the Japanese plumbing manufacturer says was inspired by the lines in nature. The bowl is glazed with a material that helps keep grime from building up. The dual flushing system lets the user choose to use a smaller or larger amount of water used: 1.6 gallons per flush for full flush or 0.9 gallons for the light flush. Cost: roughly $350 for the toilet and $660 for the concealed tank carrier. 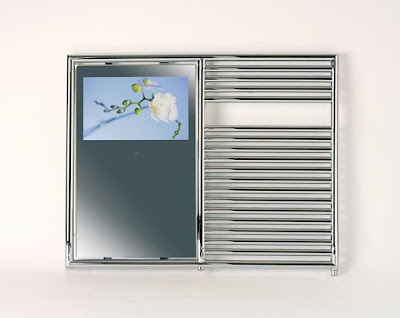 The Aquavision Towel Rail TV combines two essentials of the bath of the future: warm towels and entertainment. When you’re not watching the waterproof 17-inch LCD television, it is a mirror. See that picture on the bathroom mirror? It’s a waterproof, 17-inch wide-screen TV by the British company Aquavision. With the television turned on, the screen is visible from nearly 180 degrees, meaning that you can see it from just about everywhere in the room. The television can be installed above a bathtub or inside a shower or sauna, remaining clear and dry — not foggy, says Aquavision. HDTV is an option, and six screen sizes range from 10 inches to 40 inches. The Ondus bath system by German plumbing company Grohe blends organic form with high-tech performance and puts digital control of faucets, tub and shower in the user’s hands. Bathers can preset water temperature and flow rate. Engineering attention has been spent to mimic the flow of natural phenomena like waterfalls and falling rain. 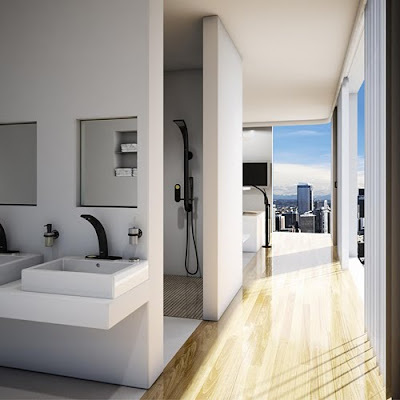 Here is the Ondus digital sink faucet (left), the AquaFountain shower system with both wall-mounted and hand-held showers (center) and, in the background, a floor-mounted bath filler, each with customizable, precision controls. When is a shower more than just a shower? In this case, when it gives you a tan and improves your complexion while you’re washing up. 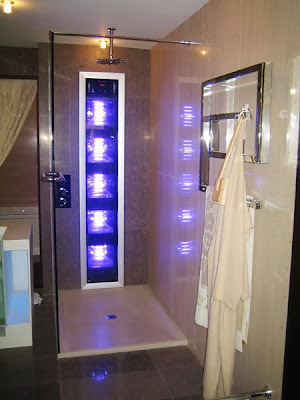 ProSun’s SunShower unit lets you incorporate a tanning unit, including five 400-watt lamps, reflectors and a double UV filter, into a shower. The 8-inch-thick unit can be added to a pre-existing shower enclosure or installed during new construction. Crave more? You can add high-intensity LED infrared light, said to stimulate the skin’s production of collagen and elastin. Units are framed in aluminum, brass or chrome — or in oil-rubbed bronze, to match your skin. While the future is mysterious, one thing’s a given: There will be stress. The newest bath products emphasize in-home spa features, making it possible to relieve stress thoroughly and in privacy. LineaAqua’s Apollo steam shower looks like a personal space capsule: The built-in reclined seat could be an astronaut’s anti-gravity chair. The blue-tinted safety glass and teak accents add to the futuristic look. You set the unit’s controls to manage the electronic temperature and steam generator or just lean back and use a remote to direct six adjustable massaging body sprays and a foot massage feature. Dim the unit’s mood lighting and crank up the audio speaker (the shower has a built-in FM radio and AUX connections for integrating your own sound system). 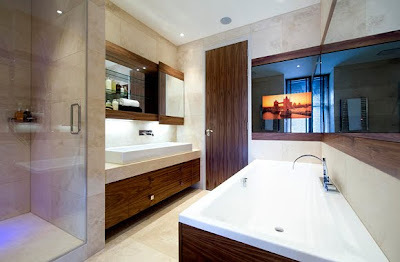 At Furniture and Design Ideas, I've written several times for various bathroom designs, but these take bathroom design concepts to another level. They look amazing.